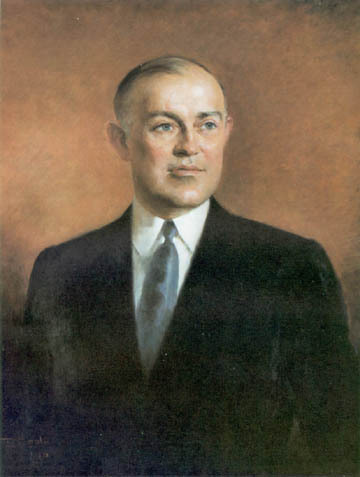 HARRY HINES WOODRING was born in Elk City, Kansas, on 31 May 1890; was educated in city and county schools; at sixteen began work as a janitor in the First National Bank of Neodesha, Kansas; moved up to become vice president and owner of the bank; enlisted as a private and was later commissioned as a second lieutenant in the Tank Corps in World War I; was elected department commander of the American Legion in Kansas, 1928; sold his banking business to enter politics, 1929; was elected governor of Kansas, 1931, and served to 1933; married Helen Coolidge, 1933; served as Assistant Secretary of War, 6 April 1933�25 September 1936, with supervision over procurement matters; served as Secretary of War, 25 September 1936�20 June 1940; projected the recommendations of his predecessor for increasing the strength of the Regular Army, National Guard, and Reserve Corps; directed a revision of mobilization plans to bring personnel and procurement into balance; stressed the need to perfect the initial (peacetime) protective force; returned to private life; ran unsuccessfully for governor of Kansas, 1946, and for the Democratic nomination for that post, 1956; died at Topeka, Kansas, on 9 September 1967. Tino Costa (1892�1947) had a varied career as a portraitist, painting subjects as diverse as King Christian of Denmark and child movie star Shirley Temple. He painted two U.S. Presidents, Herbert C. Hoover and Franklin D. Roosevelt, and General Douglas MacArthur. Costa was living in California at the time of his death, some seven years after he painted Secretary Woodring.